Infrastructure design firm Dewberry recently completed an innovative project, replacing $15 million of pipeline under the Noman Cole Pollution Control Plant in Fairfax, Va.
Dewberry used several 3D design technologies—including Autodesk 3ds Max, AutoCAD Map 3D, and AutoCAD Civil 3D—to design, plan, and schedule the five-mile “purple pipe” project. Reclaimed water is now distributed in bright purple pipes to distinguish it from drinking water in Fairfax. 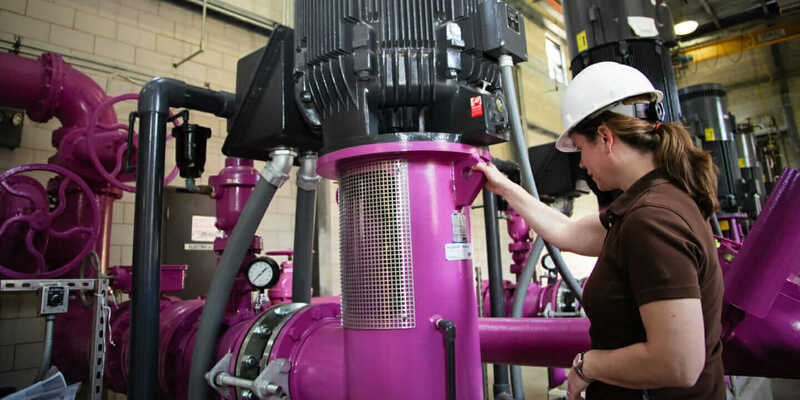 In the Noman Cole project, the reclaimed water is being used for local landscape irrigation and machinery cooling at a local energy-from-waste plant. The intricate pipe-replacement project involved more than ten government agencies to complete. Dewberry used 3D Building Information Modeling (BIM) throughout the project. That included the initial proposal, which used Map 3D to show where the proposed new work would be placed in relation to existing county GIS maps. AutoCAD Civil 3D—as well as Map 3D—was used in the design phase to detail exact placements of the new pipe network, and that information was handed off to the construction team via a Civil 3D model used to create construction documents. The crowded urban site in Fairfax required detailed planning to both get the project done on time and not disturb existing utilities. Autodesk Infrastructure Modeler was the main modeling tool for the design of the piping network and its connections. The project model combined aerial survey data, subsurface utility designations, field survey data, and proposed pipeline corridor modeling. For example, a portion of a proposed waterline fell within the limit of a six-lane divided highway, passing below a bridge on Interstate 95 and beneath a railroad bridge. The waterline’s corridor also included major utility crossings of storm, sanitary, water transmission, petroleum, underground power and telecommunications lines, gas transmission, and sanitary force mains. Subsurface utility consultants were able to provide horizontal locations of non-gravity utilities. By modeling them as intelligent BIM pipe networks, the design profiles displayed crossing locations along the alignment at proper design depths. As test-pit information was obtained at crossing locations, the utility model was updated to reflect new field-collected data, which would dynamically adjust the crossing depth in the design profile. The information for gravity utilities, including structure and pipe inverts for storm sewer and sanitary sewer, was collected through field surveys. Models of these systems were added to the BIM to accurately reflect crossing locations. The BIM allowed crossing depths to be adjusted as the horizontal alignment was modified. For more information on the Noman Cole Pollution Control Plant Water Reuse project, check out this YouTube video. How has 3D BIM helped you deliver a project? Please share your experiences below in a comment below.